Renew Resurfacing is an elite resurfacing business. 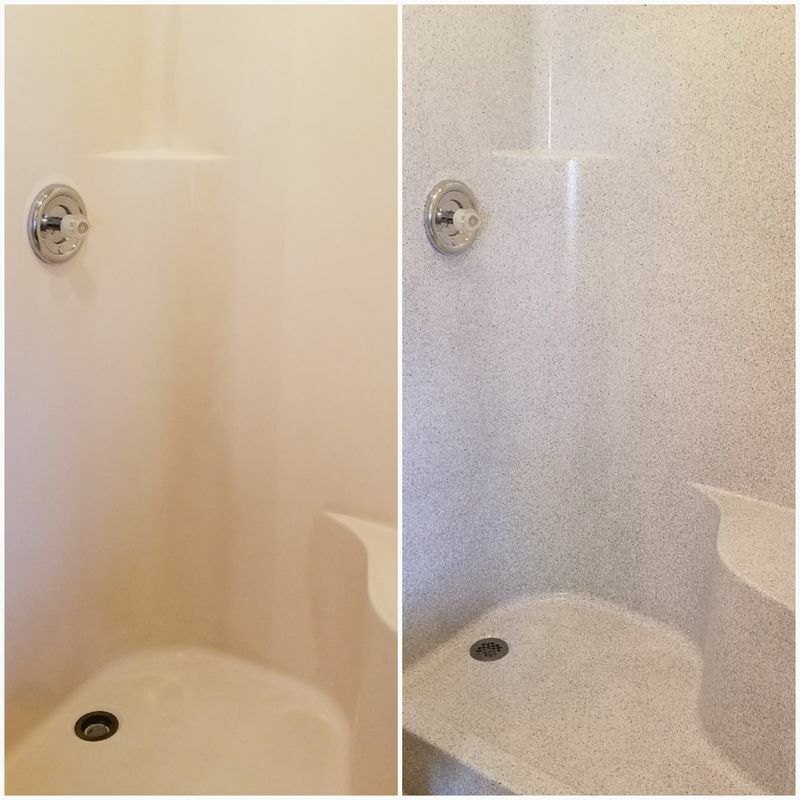 Over years of cleaning shower and sitting water on the tub side, your original finish worn away and the tub has become porous. 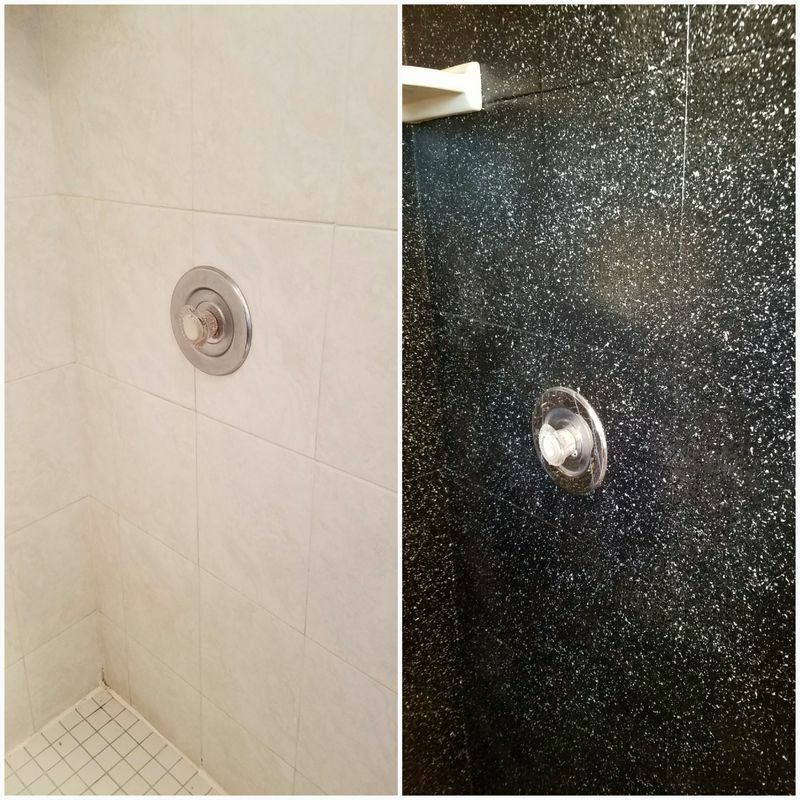 All the dirt, grime, and hard water stains get trapped inside all of the pores of your shower. 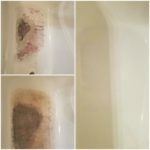 This results in you having to use abrasive cleaners and a lot of scrubbing to clean your tub. As you can imagine, the use of harsh cleaners only wears away the finish further. A new fiberglass tub will cost a fortune. 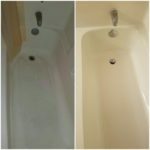 Instead of paying for a new tub, get it restored to as new condition. Every restored tub is a one of kind fully customizable product made to your desires. 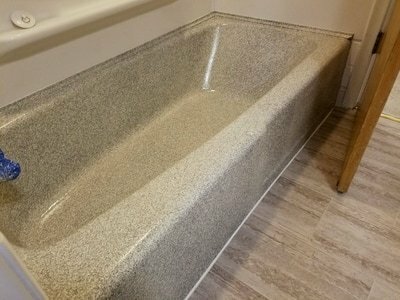 SHOULD I RESURFACE MY FIBERGLASS BATHTUB? You may be asking yourself, should I resurface my fiberglass bathtub? The answer is YES! Resurfacing an existing bathtub is much cheaper than replacing the whole tub itself. 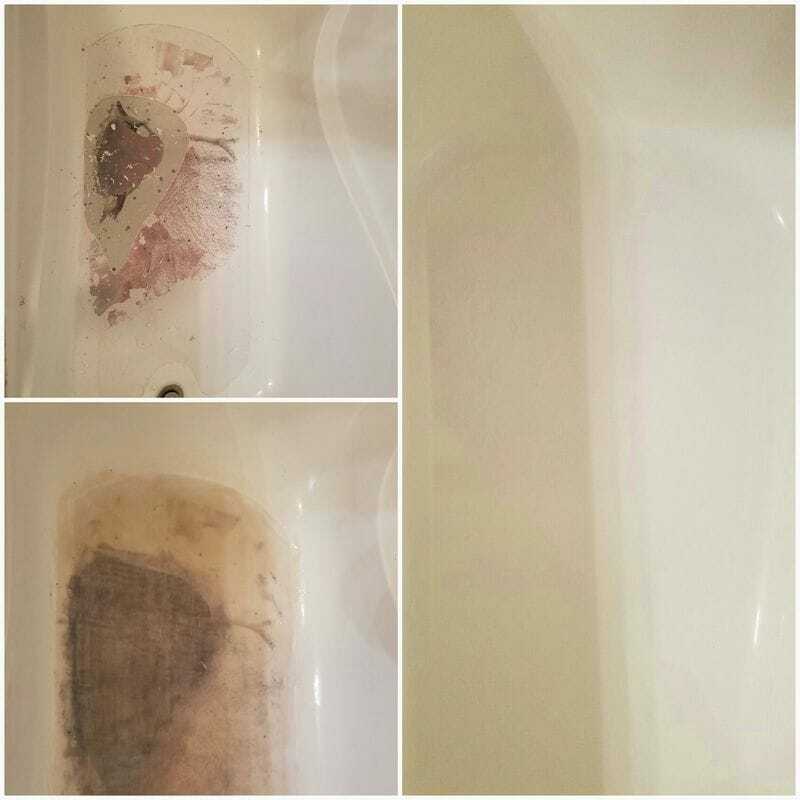 Many customers think that replacing their fiberglass bathtubs is the easiest way to change the color or to get rid of scum and mildew that has built up over the years. However, more people are looking to resurface fiberglass tubs that have lost the original finish as it is much more affordable than replacing the whole thing and gives you the look at feel of a new tub without the added cost. 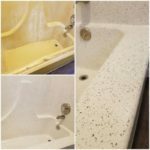 When it comes to deciding if you should resurface a fiberglass bathtub or just replace it, let the professionals at Renew Resurfacing step in and give you advice. 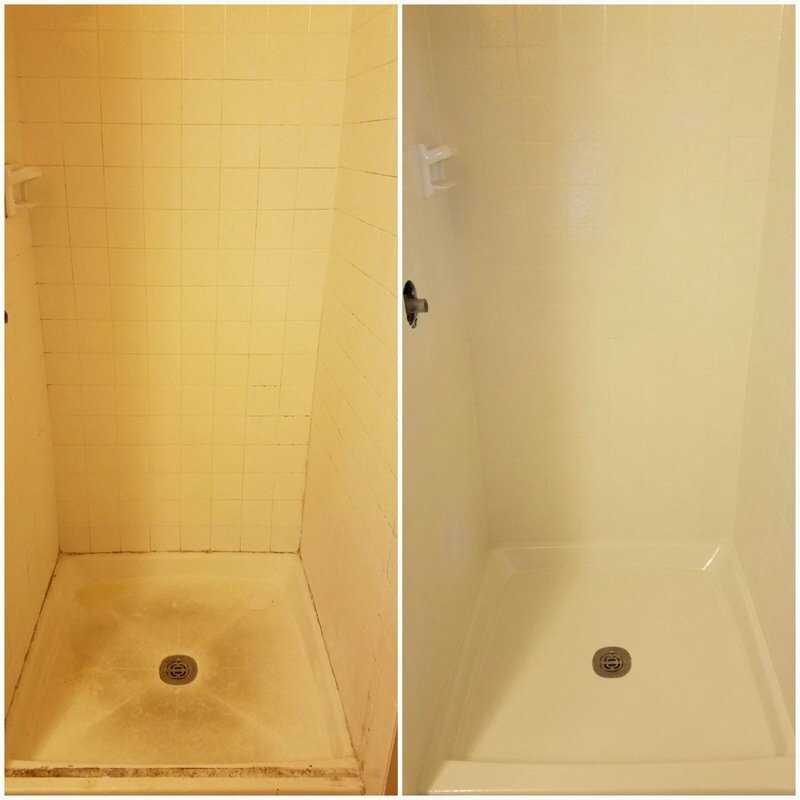 More than ever before, people don’t think their mildew covered, worn down fiberglass tub can be restored however, it is possible. 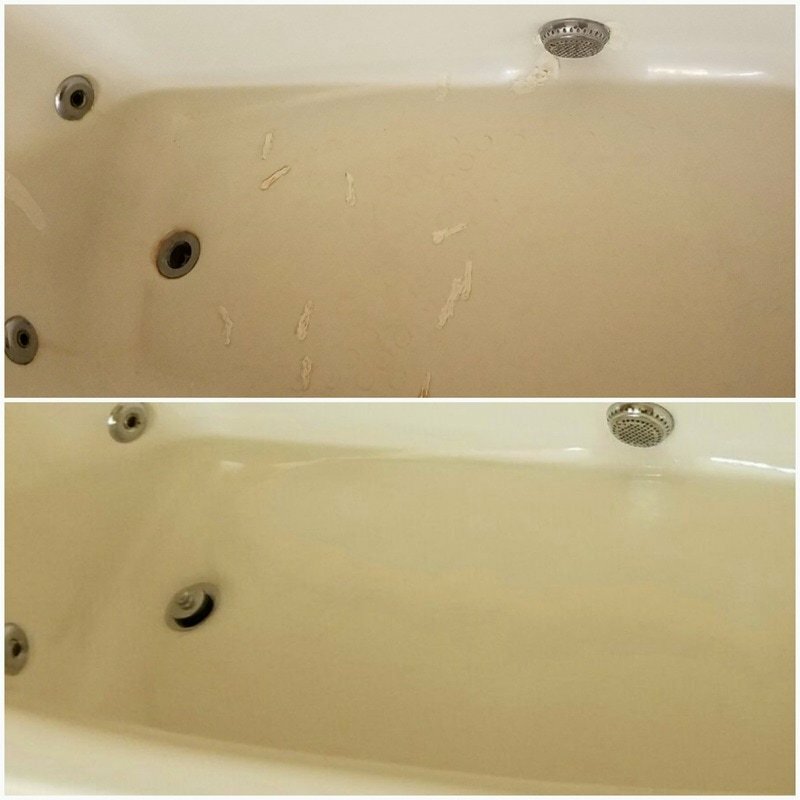 Fiberglass tubs, over the years or cleaning and water running over the edge, the original finish has worn away and the tub has become porous. All of the dirt, grime and hard water stains get trapped inside of the pores. This results in you having to use abrasive cleaners and a lot of scrubbing to get the tub clean and as you can imagine, this only wears away the finish further. 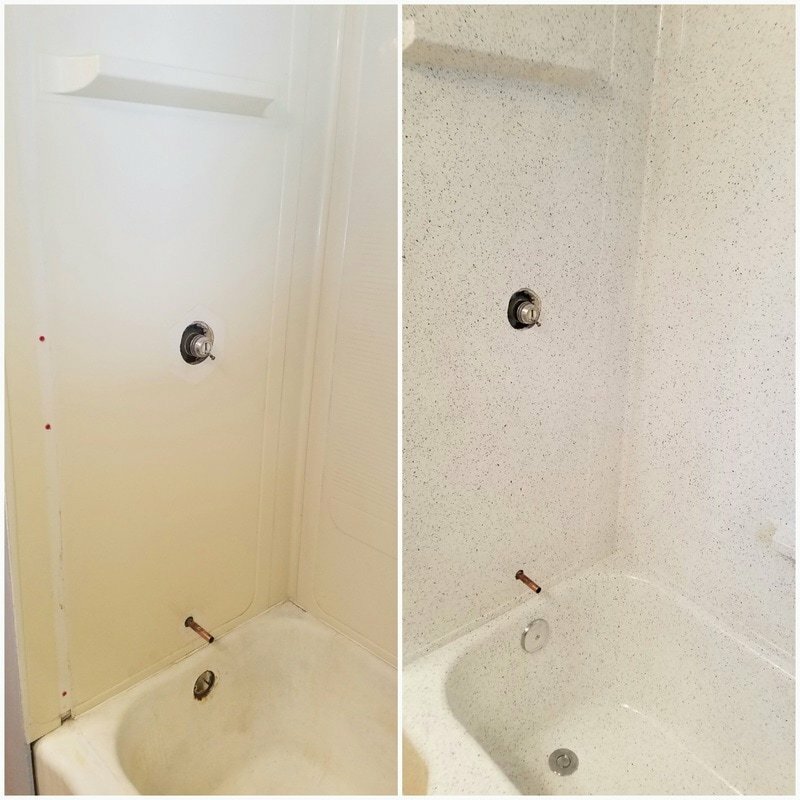 When Renew Resurfacing comes in to resurface your bathtub, we are essentially applying a new finish coat over the raw fiberglass compound giving it the look and feel of a brand new fiberglass bathtub. The new finish coat is applied as a liquid, so the tub is non-porous when we are finished. 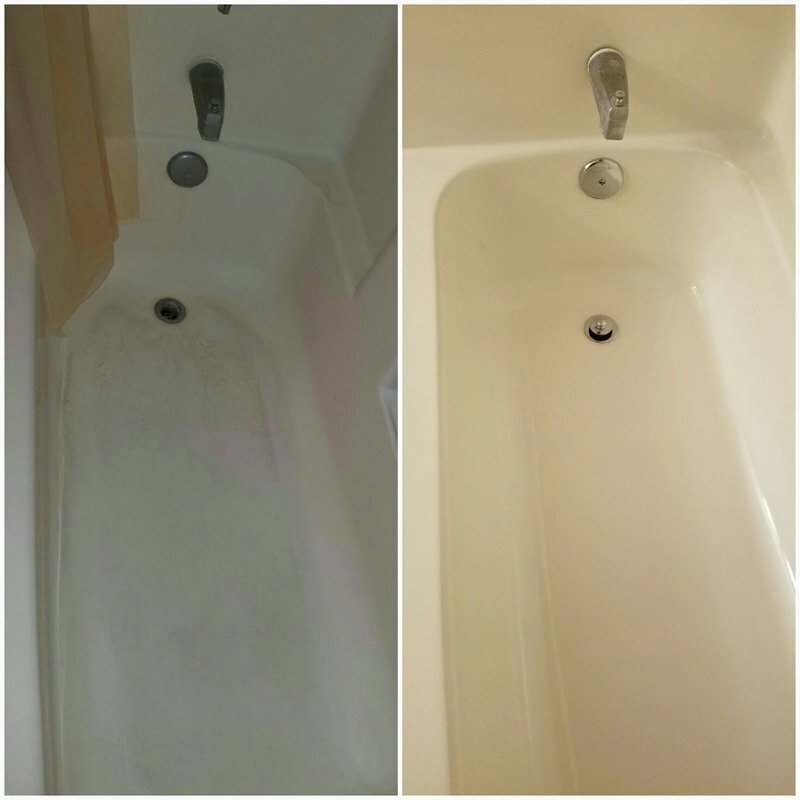 The result is your bathtub will look better, last longer, and clean much easier. Our top of the line finish has been modified for use in the resurfacing industry. Other companies may use inferior products to cut costs and in turn deliver a shorter lasting product. But at Renew Resurfacing, we use the best products in order to renew fiberglass tubs to look as if they were just installed. We work diligently to complete our products right the first time making our resurfacing not only durable but also very affordable. WHAT IF MY FIBERGLASS TUB HAS A CRACK, CHIP OR HOLE IN IT? Older, worn down fiberglass tubs get cracks and holes in them as they break down. 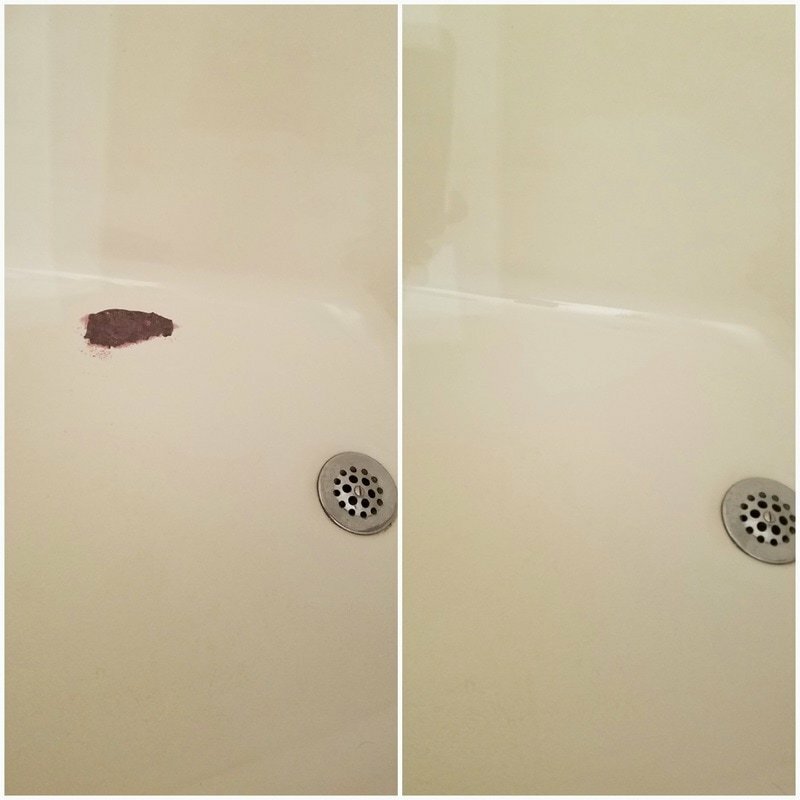 The professionals at Renew Resurfacing can fill in any significant cracks, chips, or holes in the tub. Before doing any repair work, it needs to be determined if the cracks have been caused by lack of support underneath the tub. If this is the case, we place an inlay available to give extra support then repair the cracks or holes. You can generally tell if a fiberglass tub needs more support by determining if there is any “give” when you apply pressure around the area of the crack. Chips, cracks, and holes that are on the sides or are not a result of lack of support can be fixed as a part of our normal resurfacing process. You can find out more about tub chips, cracks, and holes in our Chip, Crack & Scratch Repair. Bathtub refinish, bathtub resurfacing, bathtub reglazing and bathtub painting are all terms to describe the applying of a durable new finish coat to an existing tub. Renew Resurfacing’s process for resurfacing fiberglass or acrylic bathtubs is very cost-effective alternative to replacement. The National Remodelers Association estimates that the average cost of replacing a bathtub is $2,500 – $3,000. In addition, in most cases the new bathtub does not have the same quality as the original tub. The new tub is narrower and not as deep as the original. 70-80% savings over replacing an old tub. Use of your tub the very next day. 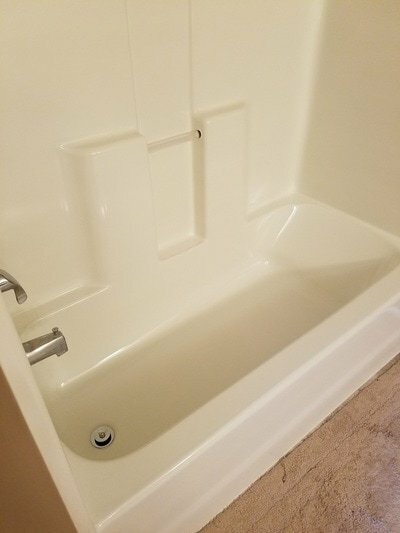 HOW DO I CARE FOR MY NEW FIBERGLASS TUB? 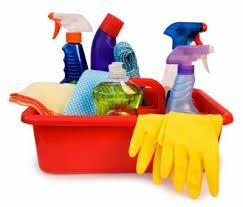 You should not use abrasive cleaners like Comet or Ajax, even Soft Scrub has some mild abrasives in it. However, you won’t need to use abrasive cleaners since the new finish will be non-porous and the dirt and grime should wipe away much easier than before. For regular cleaning, you should use cleaner that is “safe for acrylics”. There are many available such as Tilex and an Arm and Hammer product called “Scrub Free”. You also want to make sure that your bathtub drys out completely after each use. 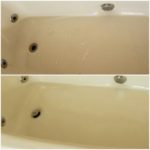 The reason for this is that water will deteriorate anything over time – even a new tub. You should repair leaky faucets immediately and keep shampoo bottles etc. off the edge of the bathtub. You should also not use a rubber mat. 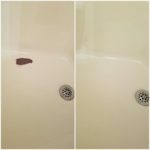 If you pick up a rubber mat from the bottom of a bathtub 3 days after you have used the tub, you will find that the bottom of the tub is still wet. In addition, the rubber suction cups will be constantly pulling at the new finish. 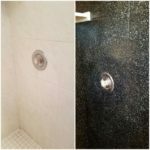 If you are going to use a bath mat, you should purchase a vinyl mat and remove the mat from the bathtub after each use.